The ideal way to recharge the Thermo-Pads in a hospital setting is in CSR. Using an equipment washer/sanitizer such as a Getinge or Sterris. A 35 minute cycle ranging from 60° C to 90° C will recharge 70 to 100 pads depending on equipment capacity. Once recharged the pads should be laid flat to let cool. In a Hydrocollator – Immerse the Thermo-Pad in a Hydrocollator heating unit for approximately 40 minutes or until all the crystals turn to liquid. Be sure to remove the Thermo-Pad once it is completely liquid and lay it flat to cool. Thermo-Pads left in the Hydrocollator can absorb water and thereby reduce the maximum activation temperature. 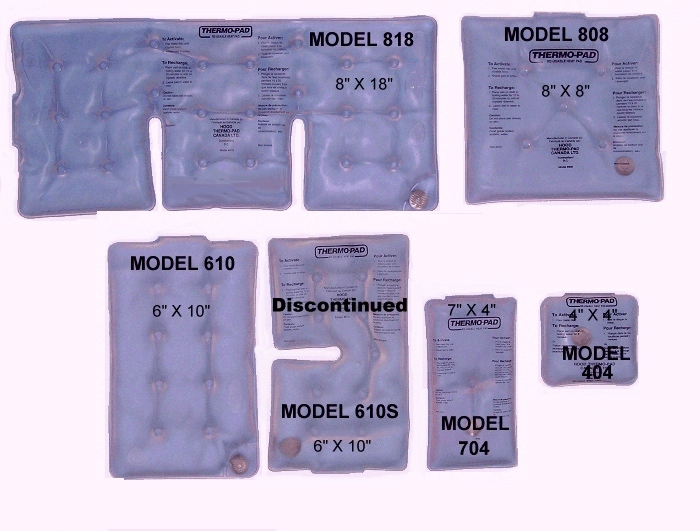 Always store Thermo-Pads in their liquid state. Thank you for your interest in Thermo-Pad. Please click on the link for the product you would like to purchase. All purchases utilize the shopping cart of our parent company, Three Dog Down / Doctor Down. Upon clicking on a specific product you will be redirected to the purchase page.